A picture that is not quite was it seems. 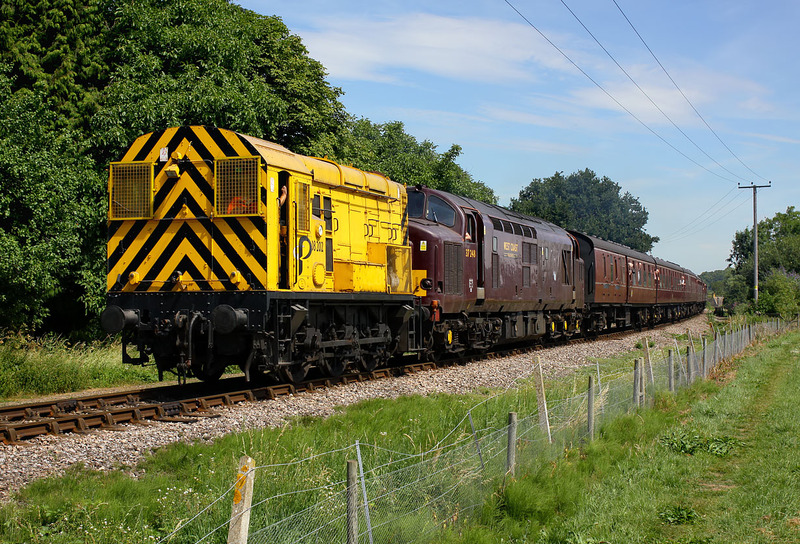 The highlight of the Gloucestershire Warwickshire Railway's 'Shunterfest' Diesel Gala on 9 July 2010 was the visit of two Class 08s from the Potter Group's Knowsley Rail Terminal. Unfortunately, 08202 only managed a few hundred yards of haulage before expiring! I thought the train was going slowly even for an 08, as it came into view around the corner. After virtually stopping, and the driver leaning out and signaling to the crew of 37248, there was the unmistakable sound of a 'tractor' powering up. So here, a dead 08202 is pushed past Didbrook by 37248 (suddenly upgraded from brake translator to motive power work!) on the 11:20 Toddington to Winchcombe service.